After 20 years in the making, this masterful epic garnered nine 1982 Academy Awards®, including Best Picture, Best Director, Best Actor and Best Original Screenplay. 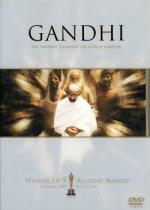 In stirring detail, Gandhi's life, principles and power explode on the screen with vivid scenes such as the horrific massacre at Amristar, where the British opened fire on 15,000 unarmed men, women and children, and the dramatic march to the sea where Gandhi led thousands of his fellow Indians to prove that sea salt belonged to all and was not just a British commodity. A distinguished cast of characters surrounds Academy Award®-winning Ben Kingsley as Gandhi, including Candice Bergen, Martin Sheen, John Gielgud and Trevor Howard. A vision of the heart and soul of a man, GANDHI is a classic epic as timeless as Gandhi himself. Wow. It’s hard to put into words how I felt during and at the end of this movie. At the same time, amazed and bewildered; triumphant and saddened; hopeful and depressed. It is all the more amazing knowing that it is all true; that a man of such humility could have this profound of an impact on India and the British Empire and help shape the politics in that part of the world to this very day. I have always enjoyed historical novels and movies, probably because I always hated the dryness of history text books, and did not learn to appreciate the lessons of history until long after I left school. The cinematography is wonderful. Ben Kingsley gives a magnificent performance of the non-violence advocate who forced Britain to give up its colonial rule of India and taught an invaluable lesson to the world; a lesson later taken up and successfully used by Martin Luther King in his fight against injustice in the U.S…. a lesson that we can all learn from. This is a movie that you will need to be in the right mood for, and have plenty of time (3 hours 11 minutes) to immerse yourself in. In fact, I recommend watching it alone or with someone who can sit still (and quiet), with the phone turned off so as to avoid any possibility of interruption (there is an “intermission” half way through). If you like history or historical figures or want a deeper understanding of how that part of the world got to be the way it is, I highly recommend taking the time to watch this one! I remember thinking back in 1983 when this film took Best Picture, that the Academy was nuts. I hadn't seen the film, but how could it have beaten Spielberg's E.T. The Extraterrestrial. For those here that were too young to remember, E.T. was a cultural phenomenon when it was released. It was a good wholesome family film that raked in a bazillion dollars. But then I finally got a chance to see it on HBO, and I was completely blown away. The three hour length just flies by. An extremely powerful film.